Aquaman is released December 12th in UK and later dates around the world. 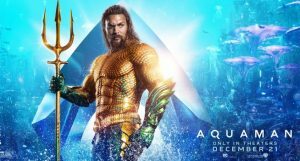 Finally Aquaman has released in the UK and we can now give our review of this Visually Stunning movie. 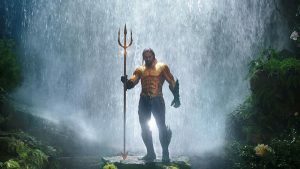 So this is my review of the Aquaman movie and I will leave it as spoiler free as I can as I want you the fans to watch this and to make up your own judgement, but think you will find it was an amazing movie and in my own words it is a great superhero story which is visually spectacular. After the controversial events of Justice league last year I will say Warner Brothers have definitely not held back and pumped absolutely everything into making this Into a movie which is superhero perfection and can only see the DC Universe of movies now turning around and being absolutely amazing from now on. What I love about the superhero movies is obviously we have to have an origin story and this isn’t exactly how the movie starts, it is a bit of an origin story mixed in with actually what’s happening now and is set after the events of the Justice league. It’s nice to start the film and get involved with the story line straight away of Arthur Curry and his family, great action sequences from the beginning and seeing Nicole Kidman in some action was brilliaiant, some jumpy parts are also included which Director James Wan definitely managed to keep some scary ideas in this from his creative Horror side, you will be jumping a few times throughout this movie when you least expect it too! With that said we obviously get to see how Arthur Curry’s parents met and then go onto the storyline of the film with a few flashback scenes here and there which we see how a younger Arthur had been training as a youngster by Vulco (Willem Defoe) a bit like we did with wonder woman and I absolutely like this idea and means that the film creators don’t have to spend an hour of the movie just to show how the character becomes the superhero but spend a lot more time of the main storyline and the great visuals. I do think we all sort of know the origin stories of every superhero in the world but it’s nice to just see some glimpses of the story rather than a lot of the film spent on showing them become a hero in the incarnations and then having to wait for sequel to really get into them. We set off on the journey with Arthur Curry and how he meets Black Manta and what happens for Black Manta to hate Arthur Curry and go after him with vengeance, we also see some amazing scenes On the submarine in their first interactions together and trust me when you see the scene you will understand why these two are enemies. 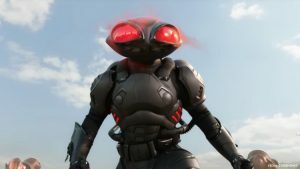 Black Manta May I tell you I absolutely loved and how we becomes him was brilliant and I really hope we get to see more of him in the future and the character is absolutely menacing and powerful. 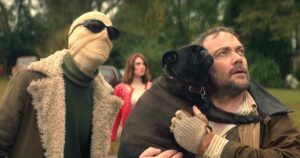 A lot of the scenes in this movie are absolutely mesmerising and James Wan has been triumphant in his beautiful direction, some of the one-shot scenes were especially iconic and must this must be the first time I’ve seen shots like this in a superhero movie and hope we get to see more of this style, they were absolutely brilliant, you will know the scenes when you see these. 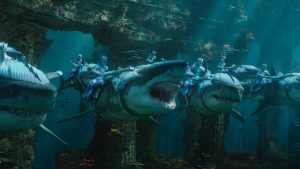 Orm (Patrick Wilson) Who is Arthurs brother in the movie wants to rule Atlantis but can’t while Arthur exists as he is next in line for the thrown of Atlantis so they end up having a massive battle under the water at the depths of the oceans with some spectacular effects. 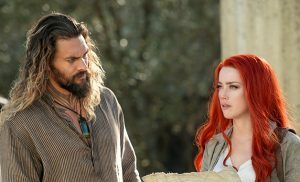 Arthur is from the land now and didn’t want to go back to Atlantis so this was a challenge for him and Mera (Amber heard) wants Arthur to embrace his destiny to become the hero he is meant to be to stop this war, this takes them off around the world at some beautiful locations to begin their quest of Arthur Curry becoming the Aquaman. And don’t worry fans the iconic orange and green custume, which is amazing I as have seen this in person and is absolutely beautiful and comic book accurate, doesn’t just turn up at the end of the movie like what I thought so you get to see plenty of action of Jason Momoa in this costume and I have to say looks bloody brilliant it. 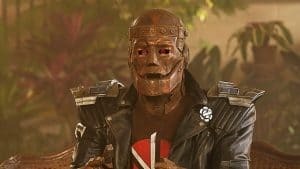 After this we go back to Atlantis for the final chapter of the movie and the events happening on Arthurs quest, I can only describe the scenes as mind blowing especially in the IMAX format and you can see every detail even on Orms hair moving was brilliant. The only way I could describe the whole movie is a bit of Indiana Jones meets Lord of the rings underwater which meets the Abyss with Star Wars and for all of these elements to come together this superhero movie was outstanding and the movie score by Rupert Greson- Williams was a mixture of fun and excitement with a couple of some very interesting choices which worked on the scenes they were in, you’ll see. As I say, I won’t give too many spoilers away but I would suggest you don’t leave the cinema until the mid credits scene has shown, after that there is no more! Trust me the scene is worth saying as that opens something up with a character for future movies. If I was to Mark this movie out of 10, I would give it a 9 as this was almost superhero perfection and really think Warner Brothers and DC Comics are turning around the DC movies finally and we are going to get some amazing films in the very near future. Thank you for reading and be sure to let us know your thoughts on here and our Twitter page @_DCWorld and join in the conversations on Aquaman.